Watch Windfall cross the bar. The reward at the end of your journey is bringing your boat through the entrance and into Bahia del Sol. During the rally season the entrance is fairly tame, even flat but some days can be quite exciting. It is not for the faint-hearted if the swell is up but everyone reports a fulfilling and a once-in-a-life-time experience. 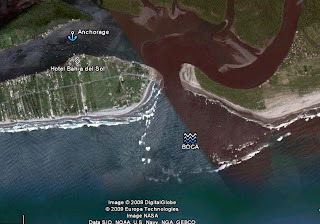 A sand bar that has a 12-foot deep channel guards the outer entrance into Bahia del Sol. The channel moves during the year so you must have a pilot to make a safe entrance. You should adjust your passage to arrive at the entrance an hour or more before high slack tide during daylight hours.Please note that El Salvador is always on Central Standard Time. If you arrive too late you will have to anchor and wait for the next high tide. Also, the pilot will not bring you in if the bar is too dangerous. Entrances are only during daylight hours. If you are required to anchor do so in 35 or more feet 1/2 mile west of the entrance to be sure to be out of the surf zone. IMPORTANT NOTE: We highly recommend that outboard powered boats NOT attempt to enter Bahia del Sol because of limited manuverability. 1) Run your engine at high speed for 5 minutes to make sure it does not overheat. If you are having overheating problems then it is better to run the engine at a lower speed when entering rather than risk engine failure in the entrance. Let the pilot know if you are having problems with your engine so he can adjust his decisions. 2) Check the steering, throttle controls, and make sure that everything on the deck is secured. 3) Ensure all loose items are stowed especially in the cockpit. 4) Close all port lights, hatches, and companionway Be sure to latch the sliding hatch. 5) All crew members must be above deck. At the appropriate time the pilot will come out to guide you over the bar. Directions from the pilot are via VHF radio. Assign a person to man the radio and forward instructions to the driver. Since no one can be below deck during entry you must have a VHF in the cockpit or a portable radio. If you do not have a portable radio the pilot can provide one. Please note that all vhf radios along the Pacific coast are programmed to "US" not "INT" or "CA"
The pilot will meet your boat and ask you to follow him slowly towards the entrance. Only one boat at a time can enter but while one boat is going in the others can stage close by so no time is wasted. Be aware that bar conditions change rapidly during the change of tide so one boat may cross in just a few minutes while others have to wait for quite a while to enter. Once you are headed in do not turn your boat around unless clearly directed to do so by the pilot. During this time, the pilot will be judging the wave periods looking for a lull. He will want you to move as close as possible to the bar so when the lull occurs you can quickly pass through. He may have you start, stop, or engage reverse periodically to accomplish this. When the lull happens he will ask you to apply full throttle and follow in his direction over the bar. The large powerboats that go through the entrance everyday have enough power to easily get over the bar before the next wave set comes in. However, slow boats do not so the next wave set will usually catch up. Have someone watch behind and inform the helmsman of the progress of the waves. When the wave picks up the boat, you will surf until the wave passes under the boat. At this time it is important to ALWAYS do your best to keep your boat perpendicular to the incoming waves rather than trying to follow the pilot. Depending on the force of the wave, it is not unusual to use quite a bit of rudder to accomplish this. The pilot will get out of your way so do not worry about running over him. Normally, two quick and exciting surfs and you are over the bar. Ignore your depth meter because sometimes suspended sand will give you a false reading. Welcome to El Salvador! All the above instruction may seem a bit unnerving but crossing the bar is normally safe, quick, and easy. Weather and swell conditions during the rally season are usually calm and bar is seldom rough. Hundreds of boats have traveled in and out of the entrance without a problem. That all being said, there is always a risk of a mishap. No matter how calm the conditions bar crossings should never be taken lightly. The main entrance to the estuary is about ½ mile past the bar. After crossing, you can slow your engine and steer up the middle into the boca (mouth) of the estuary. After passing through the boca you will turn left into smooth water. Get out your dock lines and fenders. Be sure that your fenders are dragging well in the water because the docks are very low. The hotel staff will direct you to a slip where you will meet the immigration and port officials to complete your check-in. Hotel Bahia del Sol has on-site port authority and immigration service. To enter the country they will ask for a copy of your passport, boat documentation, the original exit Zarpe from your last foreign port and ten US dollars for each 90-day visa. No need to fly the Q-flag. It is all very low-key and friendly. Visas obtained in El Salvador are issued for 90 days and are good for four Central American countries, El Salvador, Guatemala, Nicaragua, and Honduras but only for those traveling by land. If you take your boat to one of the other countries you will have to get a new visa and a Zarpe. Visitors may travel freely across land borders from one of the countries to any of the others without entry and exit formalities at immigration checkpoints however, it is important that you insist on an entrance and exit stamp when traveling Guatemala to avoid any "fines". Tourists who wish to remain in the four-country region beyond their initial 90-day visa can obtain a one-time in-country (not required to leave) 90-day extension by applying at Migration in San Salvador and paying $25. You will be required to show reason why you cannot leave the country (hurricane season, illnesses. etc) and have a resident or company sign an affidavit to “sponsor” you. The hotel can supply an affidavit for you. Forms are available on-line and you will need two photos. When that visa expires, you are required to leave the four-country area, the nearest being Mexico, Belize, or Costa Rica. Many cruisers schedule their inland travel to include travel briefly outside the four-country region to renew their visas just prior to the expiration date. Port fees are $1 per day to use Salvadorian waters. The fee is payable in 30-day increments up to 90 days. After 90 days you must renew your permit at the port offices (AMP) located on the hotel grounds. The permit has unlimited renewals. If you leave your boat unattended over 90 days you can pay for your permit when you return.